Marion L. "Mare" "Whitey" MacGaffey (nee White), age 74, a resident of Warrenville, IL since 1951, passed away on Thursday, April 4, 2019, at her home after a valiant and honorable fight with lung cancer. She was born December 6, 1944 in Chicago. Her spirit is carried on by Laura (Todd) Main of Frederic, WI, Michelle (Christina) Alvis of San Jose, CA, Robert MacGaffey of Yorkville, IL and Michael MacGaffey of Warrenville, IL, adored grandmother of Madison Main; Jordana, Joseph, Jadyn and Jacob MacGaffey, cherished daughter of Richard T. White of Warrenville and the late Dolores A. (nee Childs) White, loving sister of Richard T. (Joyce) White, Jr., Michael White, Elizabeth (the late Stephen) Brogie and Virginia Stamm, fond cousin, sister-in-law, aunt, great-aunt, friend of many and former spouse of the late Robert W. MacGaffey, Sr. (Warrenville Fire Department). Marion moved from Chicago to Warrenville at the age of seven when her dad decided to move his family out of Chicago to the “country”. She was a 1962 graduate of Wheaton Central High School. A loving and devoted homemaker for the first part of her life which she treasured, and in 1982 she started working at the Illinois Hospital Association in Naperville for 34 years, initially in the Finance department, then moving up to a Claims Examiner, Claims Examiner Supervisor and finally retiring as a Systems Administrator. Marion was a longtime member of St. Irene Catholic Church in Warrenville, IL and was also a member of The Warrenville Fire Protection District Women’s Auxiliary. Marion will be remembered for her unconditional love she gave to everyone she knew, a caring disposition towards all, and for not having one mean bone in her body! She was the family glue that simply held us all together. Her house was a home not just a house. 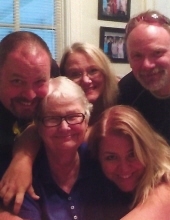 Her kitchen table (aka “cawfee tawk” time) was the place for one and all and she was the mother, sister and friend for so many of us who sat there talking about everything or nothing and helping everyone to try and figure out this thing called “life”. And trust all of us who knew her, there is no one that could have done life better than she did it! We all wish we had one more time to sit with her at that table. She was an avid reader and enjoyed sewing, photography and all plants and flowers and anything related to gardening. Her beautiful penmanship was admired by all. Visitation will be held Monday, April 8, 4:00-8:00 PM at Friedrich-Jones Funeral Home & Cremation Services, 44 S. Mill St., Naperville, IL. A Mass of Christian Burial will be celebrated Tuesday, April 9, 10:00 AM at St. Irene Catholic Church, 28W531 Warrenville Rd., Warrenville, IL with Rev. Jim Antiporek officiating. Interment will follow at Assumption Cemetery, Wheaton, IL. A lunch will follow open to everyone. Details of lunch to be announced at the burial. For more information, please visit www.friedrich-jones.com or call (630) 355-0213. To send flowers or a remembrance gift to the family of Marion L. MacGaffey, please visit our Tribute Store. "Email Address" would like to share the life celebration of Marion L. MacGaffey. Click on the "link" to go to share a favorite memory or leave a condolence message for the family.